The Three Little Pigs gives the classic fairy tale a new and modern sensibility that will leave NAMT audiences grinning from ear to ear. The committee was tickled pink by the thoroughly original, upbeat score and were captivated by the endlessly entertaining bovine brothers. A sure-fire family hit! 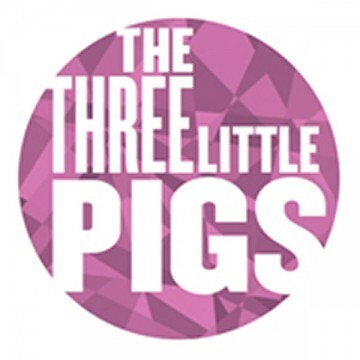 The Three Little Pigs was commissioned by the Singapore Repertory Theatre, specifically for their Little Company and forms the first in a “trilogy of trios” (along with Goldilocks and The Three Bears and The Three Billy Goats Gruff). It premiered for 70 sell-out performances at the DBS Arts Centre in Singapore in March 2012 (in English), and returned for a further four-week run at the same venue in July 2013 (in Mandarin). The show has also played at The Greenwich Theatre, London and will open at Emerald City Theatre, Chicago in January 2014. Licensed through Music Theatre International. Full production at Weston Playhouse Theatre Company (VT); ZACH Theatre and four other theatres in 2014-2015, West End production in summer 2015. Printed versions of The Three Little Pigs date back to the 1840s, but the story itself is thought to be much older. The Three Little Pigs was included in The Nursery Rhymes of England (London and New York, c.1886), by James Halliwell-Phillipps. The story in its arguably best-known form appeared in English Fairy Tales by Joseph Jacobs, first published in 1890 and crediting Halliwell-Phillipps as his source. We have named our three eponymous heroes Cha, Siu and Bao after a favourite dim sum dish – steamed buns filled with barbecued pork. Our show forms part of a ‘trilogy of trios’ (the companion shows being Goldilocks and the Three Bears and The Three Billy Goats Gruff). Each can be performed by the same 5 actors, and each show has a running time of approximately 45 minutes. Our musical was commissioned by the Singapore Repertory Theatre for their Little Company, who stage productions for younger audiences – in this case the target age is 3 and up. The show opened in Singapore in 2012 and played for four weeks to sell-out audiences in a 375 seat theatre. It was revived in the same venue in July 2013, this time translated into Mandarin, where it played for a further four weeks to capacity houses. The Three Little Pigs was performed in Singapore to pre-recorded backing tracks featuring arrangements by the highly-talented local musician, Ruth Ling. We were so delighted with her work on the show that we now make these backing tracks available to any theatres who want to produce the show, if they so wish.